The month of March celebrates, encourages and commemorates the vital role of women in American history. This is a time to reflect on the past and all that has been accomplished, while also looking forward to a bright future. Southeast as a whole has many numerous leaders across campus, ranging in responsibilities and job descriptions. One area specifically with a strong female presence is Southeast president Carlos Vargas’ executive staff. There is a total of nine positions on the staff, and six of those positions are held by women. Those six women come from varying backgrounds that led them to where they are today, however, there is a commonality between them all. Each was influenced by positive female leadership, both here at Southeast and elsewhere, that directly impacted their careers. Sonia R. Rucker, assistant to the president for Equity and Diversity and dean of students, coordinates Title IX efforts for the university, as well as receiving and investigating faculty, staff and student equity issues and complaints on campus. Rucker said she still leans on women for guidance and support when needed. 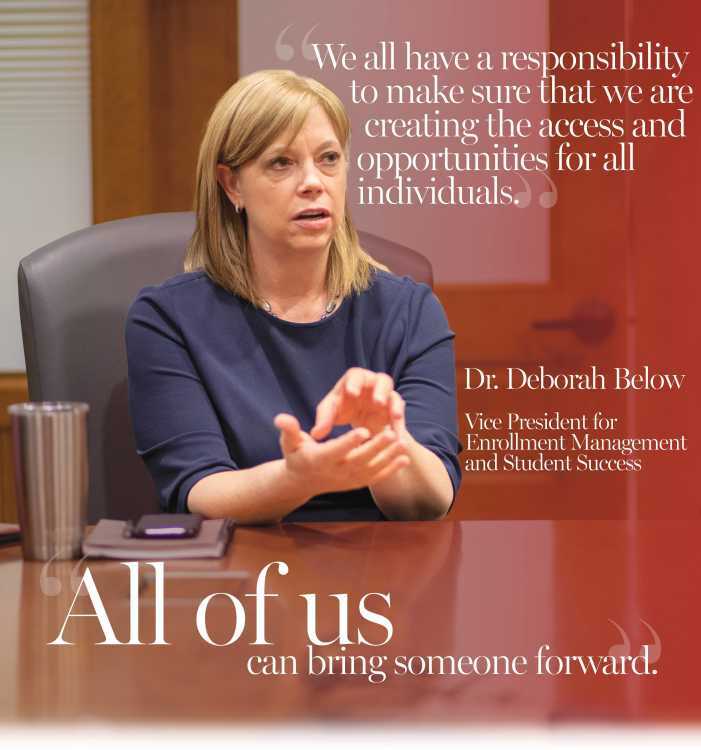 Both Dr. Deborah Below, vice president for enrollment management and student success, and Ann Hayes, director of university of communications said that they have worked with many influential female leaders throughout their time at Southeast. In their positions, these women cover a variety of responsibilities on campus, covering categories such as finances, enrollment, equity and diversity and more. These women work on project and initiatives ranging from assisting collegiate women in networking with alumni to facilitating to working toward equality and understanding. 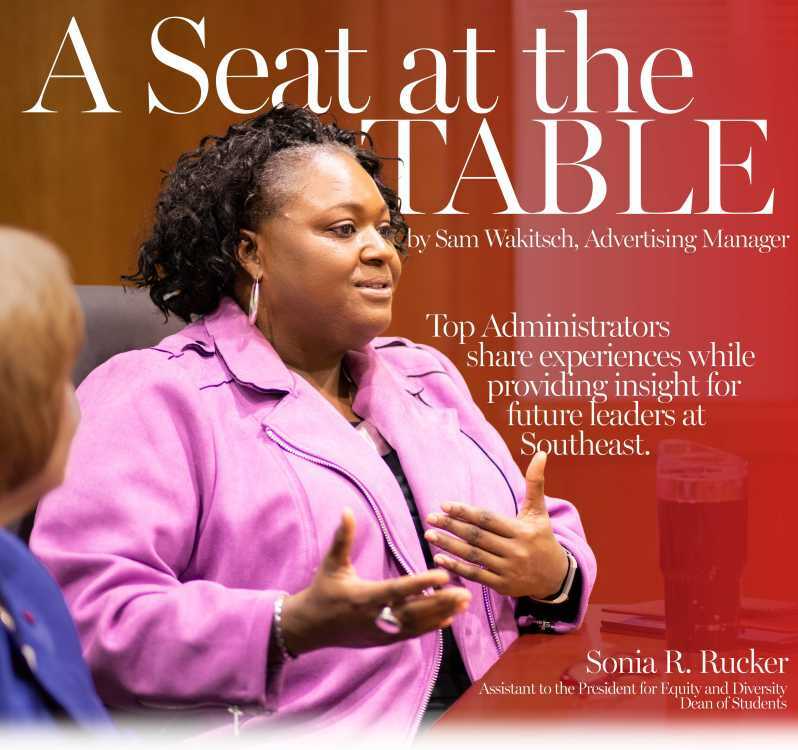 Trudy Lee, vice president for university advancement and executive director of the University Foundation, said that in her position she sees, how alumni involvement directly impacts Southeast. In addition to the financial contributions that have been made over the years by women, the Power of Women Luncheon is also put on to inspire women throughout the campus by connecting them with women and alumni in the community. This year’s event will be held on April 10. Lee expressed hope that the collegiate women today can continue following in the footsteps of those before them. Rucker explained that in her position as the Title IX Coordinator and equity officer she has the opportunity to listen to situations and stories, both good and bad, which allows her to gain insight into different areas that still needing growth and development. She also said she hopes to facilitate change for people so that they feel more comfortable in terms of speaking up or speaking out. “We always have challenges, and sometimes those challenges kind of help you get to the next level and see things that are not necessarily equitable or are not working the way that they should. I think in my position as the Title IX coordinator and equity officer I have an opportunity, whether it is good or bad in some situations, to hear the stories of how people may be struggling, or how women might not necessarily be feeling equitable or feel valued in the way that they want to be in their careers,” Rucker said. Hayes reflected on the students that have worked in her office over the years, and where they are at now. “Hopefully in some way, I’ve made some kind of impression or impact on them,” Hayes said. Below said all the women on the executive staff are task-oriented and visionary with a responsibility to be the leaders and facilitators the campus needs. The women shared some advice and thoughts for not only collegiate women but the Southeast students as a whole.